Well that’s about the sweetest thing ever, Angie. And yes…yes I do love these cookies! 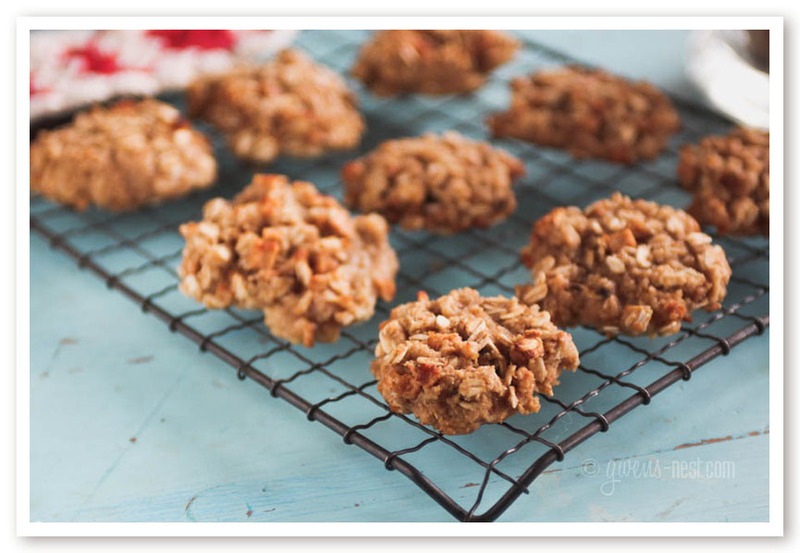 Soft oatmeal cookies, studded with dried apple bits- what’s not to love? Oh, and did I mention that they’re sugar free, gluten free, and a THM E snack or dessert? Oh. Yes. It’s always a challenge to find a delish E treat that’s grab and go, but these cookies fit the bill. They could really pass as a breakfast cookie (but you’d want to add some protein into your meal too…maybe a little collage in your coffee?). The cookies scoop and bake just like regular sugar filled cookies, and no one here has been able to tell that they’re sugar free. But I think my refusal to share, and calling them “diet food” is starting to tip them off that these are REALLY good. I’ve been HAPPILY enjoying my E meals and snacks now that I have a nice stash of these in the fridge. Thank you, thank you, thank you, Angela! 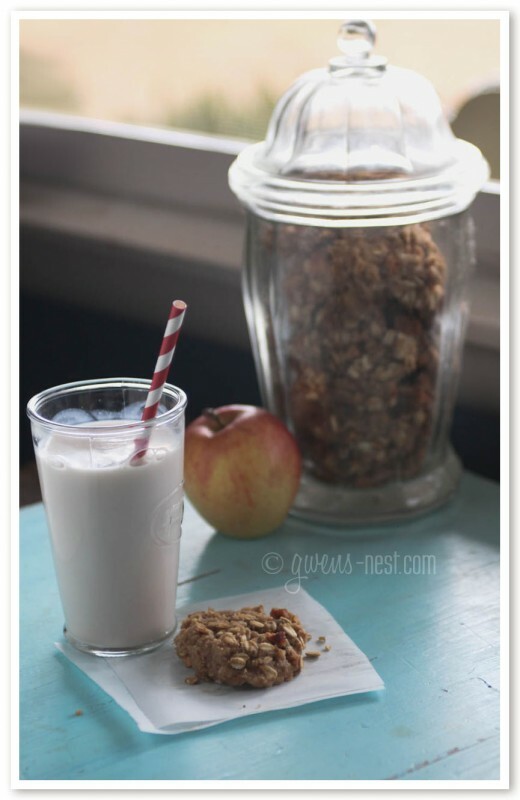 You’ve revolutionized my E snack time this week with your wonderful oatmeal cookie recipe! 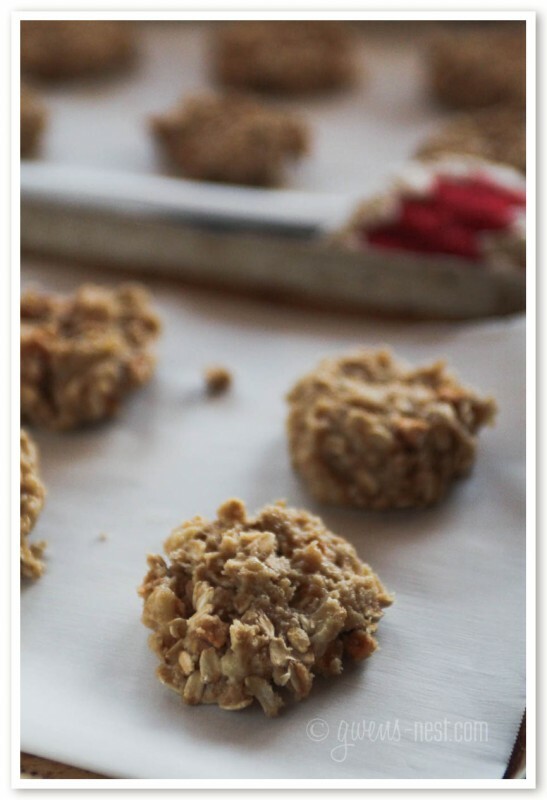 These delicious cookies are a healthy slow carb dessert, snack, or even a fantastic breakfast cookie! And they're gluten free, sugar free, and THM friendly as an E.
Preheat oven to 350 degrees, and line 2 baking sheets with parchment paper. THM Sweet Blend, Greek yogurt, and vanilla. Whisk to combine. 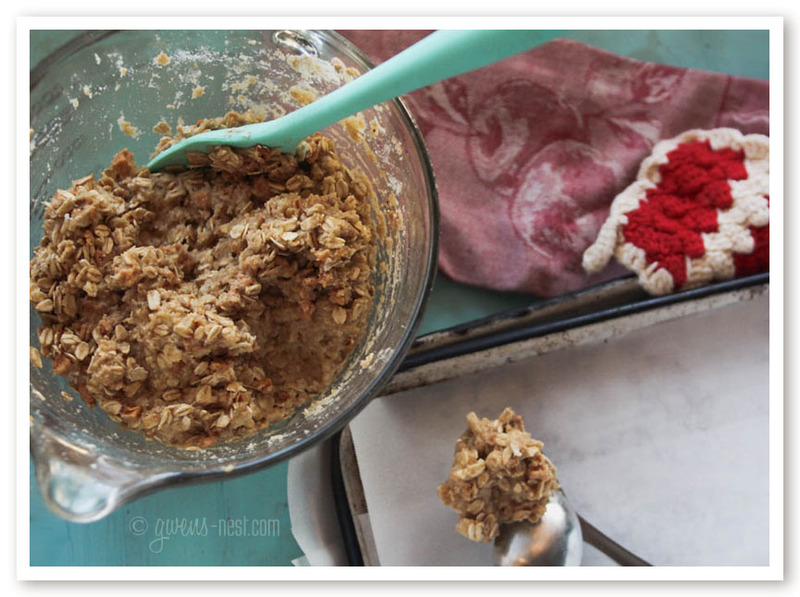 Add THM Baking Blend, baking powder, baking soda, cinnamon, and salt into the bowl, and stir until just combined. 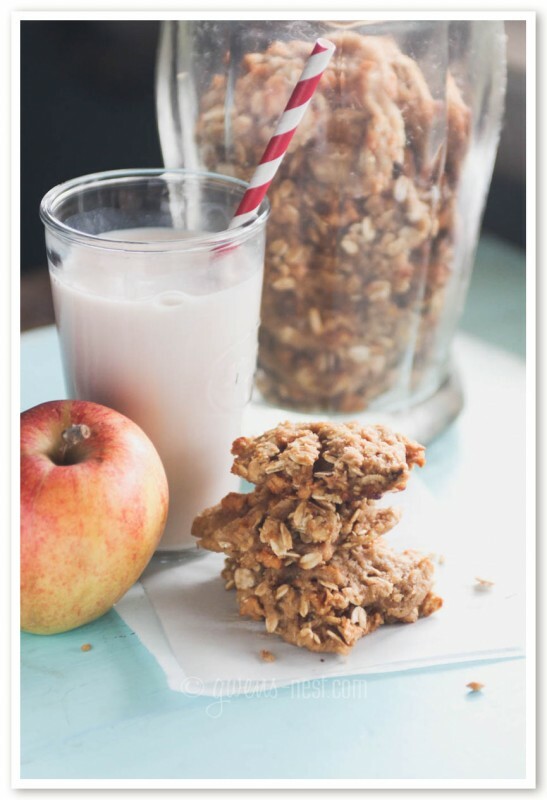 Fold in the oats and apple pieces. Drop by tablespoons onto the baking sheet- I flatten mine down a little. Allow cookies to sit for a few minutes for the dough to thicken up- this will prevent them from spreading thin when baking. Bake for 12 minutes until cookies are slightly golden brown. Store in the fridge in a sealed container. I enjoy one or two as a dessert or snack with an additional protein source. **if you don't have baking blend, you can try subbing 1½ cups of oat flour, or 1⅓ cup oat fiber, 1½ tablespoon coconut flour, 1 tablespoon almond flour, ⅛ teaspoon glucomannan, ⅛ teaspoon collagen. 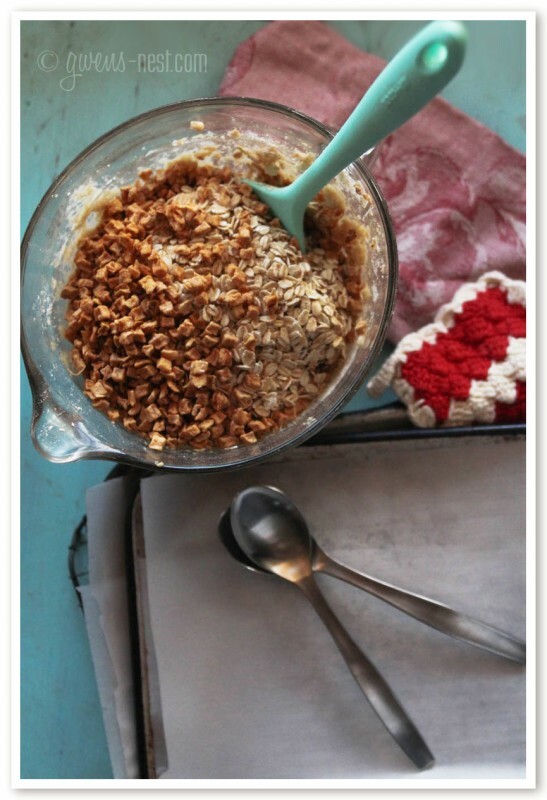 Use oat flour to make this a nut and coconut free recipe! 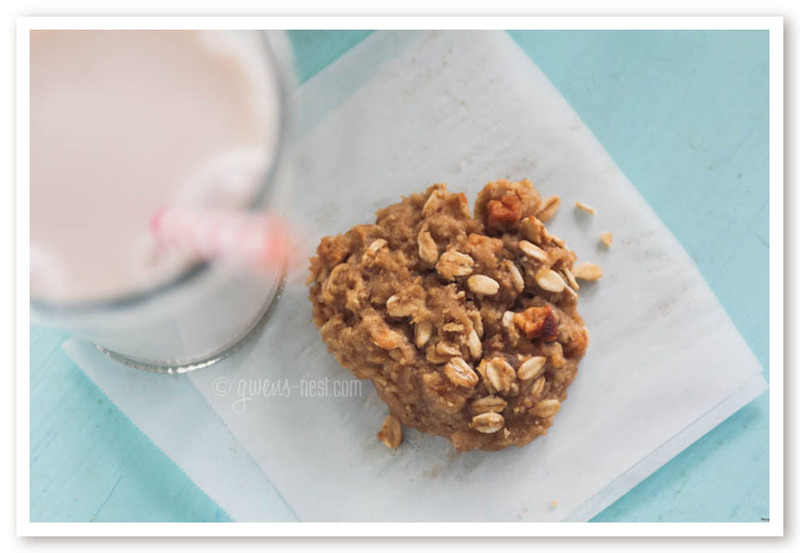 Be sure to thank Angela for sharing her delicious oatmeal cookie recipe! 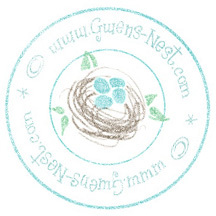 If you’d like to contribute a recipe for me to test, photograph, and publish on Gwen’s Nest, please send it to me here. I love testing out your recipes! « Feast Cookbook is Here! Hi. These look really good, but I have a severe allergy to bananas. What would you suggest that I could use instead? Thanks! Try using all applesauce instead. I think I’ll try that next too. 🙂 OR you can sub additional yogurt for the banana. My guess would be about 1/3 to 1/2 cup. Hey these look yummy! Would you clarify about the alternative flours(just the 1 1/2 c oat flour, or do I also add the TB almond flour and xanthan gum)? Attempting to make nut and df. Tia! Hi Charee! For nut free, I’d use only oat flour for the entire amount. I don’t add xanthan or almond or anything else when using oat flour, because it’s lovely all on its own. Where do you find dried apple pieces? 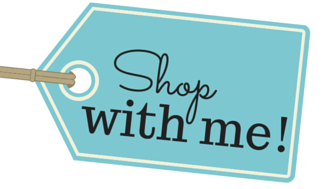 Do you have a brand you recommend? Oh stink…I DO try not to use hard to find ingredients for you guys. Oops! I find my dried apple pieces at the Dekalb Farmer’s Market already diced, but you’re right…I haven’t seen them like this in normal grocery stores. You can do one of 3 things here: use the freeze dried apple crisps and dice into bits, OR just regular dried apple rings, chopped. OR, you can chop an apple into small dices, and dry in your oven (or do rings and dice them afterward). Do you cut apples and let them dry out? Could you use fresh chunks or craisans instead? Where do you find the sweet brown sugar substitute? You can find the Sweet Brown Sugar Sub here. 🙂 I’ll update the recipe with a link too…thanks for asking! These look great! I need a few more yummy E’s in my life! ☺️ I would like to try these! These cookies are Amazingly delicious! No changes needed! Any grocery store that sells nuts/dried fruits in bins where you scoop out as much as you need will have the dried apples. I ordered the THM products online.